NEREUS Vice-President and regional politician, Bernard Plano, added, “These user-stories will definitely help us to learn more about the different Copernicus realities across Europe, but also how we can make them a reality in our respective territories”. The PROTHEGO team were invited to submit a user story article to the Copernicus4Regions publication. 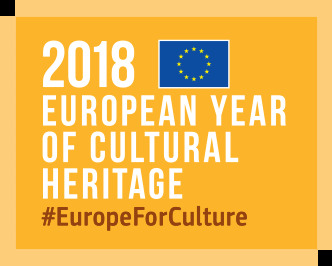 If our contribution is included, it will form part of the publication that will be presented in Autumn 2018 in the form of a dedicated event at the European Parliament addressing policymakers at EU, national and regional levels. Selected representatives from local and regional authorities will be invited to share their user experience with a political audience, and describe the impact of their space-enabled solutions on their administrations. The PROTHEGO team presented three posters and gave one oral presentation at this year's EGU General Assembly. 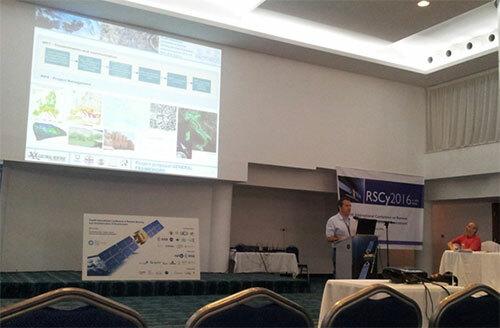 PROTHEGO attend the RSCy Sixth International Conference on Remote Sensing and Geoinformation of the Environment 26–29 March 2018, Cyprus. The PROTHEGO team at UNESCO, after the dissemination workshop. 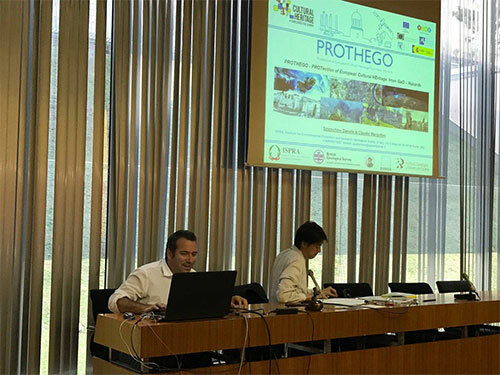 The past three years' work conducted by the PROTHEGO team culminated in a high-profile dissemination event at UNESCO's headquarters in Paris. Around 100 people attended the event, which discussed the role of satellite monitoring to detect geohazards and their impact on cultural heritage. In addition to presentations made by the PROTHEGO team and associate partners, we were delighted to hear from Mechtild Rössler, director of heritage division and director of the World Heritage Centre at UNESCO; Giovanni Boccardi, chief of UNESCO's emergency preparedness and response unit; Cristina Sabbioni and Patrizia Bianconi from the Joint Program Initiative on Cultural Heritage, and Vincenza Lomonaco, the permanent delegate of Italy and ambassador to UNESCO. Delegates also received updates regarding satellite monitoring and cultural heritage form the European Space Agency and the Agenzia Spaziale Italiana. The event generated lots of positive discussion between delegates regarding ways forward and how to better use satellite monitoring in this domain. 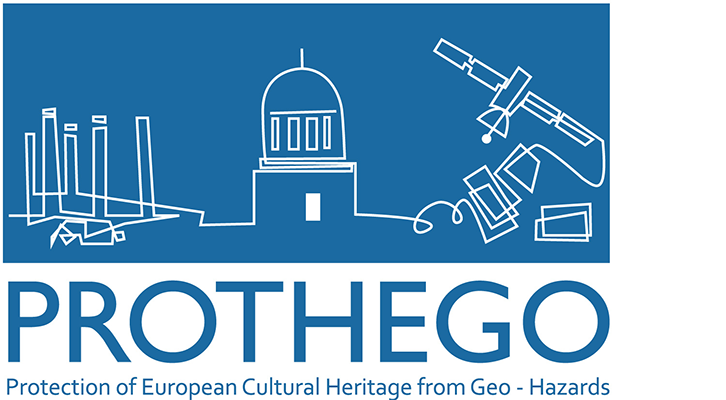 The PROTHEGO team is delighted to announce that the 'European World Heritage Sites affected by geohazards — satellite monitoring future challenges: the PROTHEGO project contribution' is now officially included in the European Year of Cultural Heritage. The European Civil Protection Forum is the largest recurring public event on European cooperation in the field of civil protection and is organised every two years by the European Commission's Directorate-General for Civil Protection and Humanitarian Aid Operations. The PROTHEGO team were invited to provide information and display a poster about the project at the JPI-CH stand at the event. Safety Workshop 2017 – Tenerife 12–13 December 2017. José Fernández Merodo was invited to give a lecture about the PROTHEGO project at the Safety Workshop in Tenerife 12–13 December 2017. The topic of the workshop was the management of geological hazards in the Canary Islands, in the field of Civil Protection. Presenting PROTHEGO at the SAFTEY workshop. 29 November 2017 — SAFETY workshop 2017. 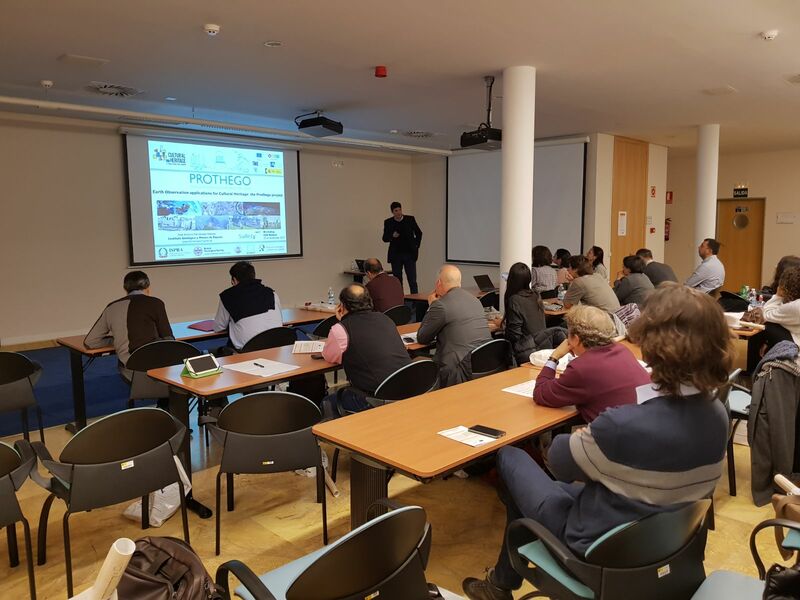 José Merodo presented "Earth observation applications for cultural heritage: the PROTHEGO project" at the "SAFETY workshop 2017: sentinel for geohazard prevention and forecasting" in Madrid, Spain. This workshop was organised in the Central Geophysical Observatory of Madrid by the SAFETY project. SAFETY is a European project funded by the European Commission, Directorate-General Humanitarian Aid and Civil Protection (ECHO). Big Block monitored in Petra's Siq. 17–18 November 2017: PROTHEGO workshop and 5th consortium meeting — Petra, Jordan. The PROTHEGO consortium was kindly invited to participate in a workshop entitled "Knowledge sharing and capacity building on Protection of Cultural Heritage form Geohazards" by Dr Fawzi Qasim Abudanah at the Petra College for Tourism and Archaeology, Wadi Musa, which is part of the Al Hussein Bin Talal University. During the workshop, we heard from Eng Khaled Amryyin about the experiences of the Petra archaeological park and the various activities they undertake to protect its distinct cultural heritage from geohazards. Some of the participants at the workshop on Cultural Heritage. Dr Marina Marcelli spoke about the experiences she faces when maintaining and protecting the cultural heritage of Rome's historic centre. 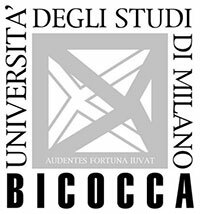 There were also talks from Claudio Margottini from the Cairo Embassy, regarding the cultural heritage in the Middle East, and from Cristina Sabbioni, regarding the JPI-CH European Joint Program initiative on cultural heritage and future dissemination opportunities. The PROTHEGO consortium were then invited to showcase the project to date and explain each partner's contribution. 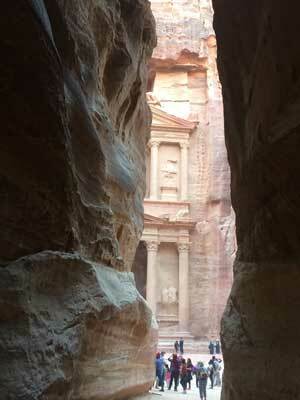 Towards the end of Petra's Siq with views of the Treasury. 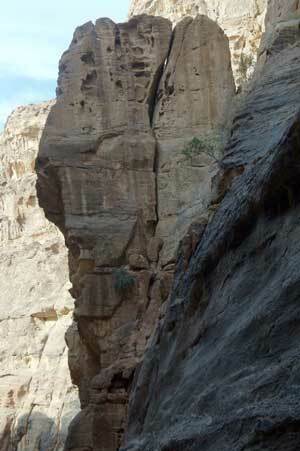 The workshop concluded a guided tour of Petra's Siq by Eng Khaled Amryyin to view some of the intervention activity (e.g. debris cleaning, debris terracing, water diversion and block stabilisation or dislodgment) undertaken to reduce the likelihood of rock fall in the vicinity. The following day, the consortium met to review progress against each work package and deliverable and discuss each case study. PROTHEGO will be presented by Francesca Cigna with a poster led by NERC-BGS at the upcoming ESA Fringe Workshop 2017, "Advances in the Science and Applications of SAR Interferometry and Sentinel-1 InSAR", in Helsinki, Finland on 5–9 June 2017. Instituto Geológico y Minero de España participated in the seminar organised by the Patronato of the Alhambra: "Gestión de Riesgos y Emergencias en Arquitectura Defensiva de Tierra" (in Spanish). We presented PROTHEGO and some results regarding Alhambra and Albaycin (in Spanish). Daniele Spizzichino (ISPRA) presents PROTHEGO during the ICL–IPL Conference 2016. PROTHEGO has been included in the 2016–2018 agenda of the International Programme on Landslides (IPL). This was achieved following a presentation delivered by Daniele Spizzichino (ISPRA) during the 2016 IPL UNESCO Symposium and ICL–IPL UNESCO Conference, organised by PROTHEGO's Associate Partner, the International Consortium on Landslides (ICL), on 15–18 November 2016 at UNESCO Headquarters in Paris, France. Kyriacos Themistocleous (CUT) presents PROTHEGO at EUROMED 2016. 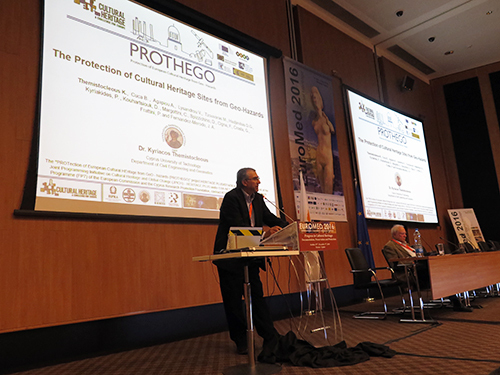 PROTHEGO was showcased by Kyriacos Themistocleous (CUT) during the International Conference on Digital Heritage – EUROMED 2016, 31 Oct–5 November 2016 in Nicosia, Cyprus. Kyriacos Themistocleous (CUT) presents PROTHEGO’s Choirokoitia demonstration site. 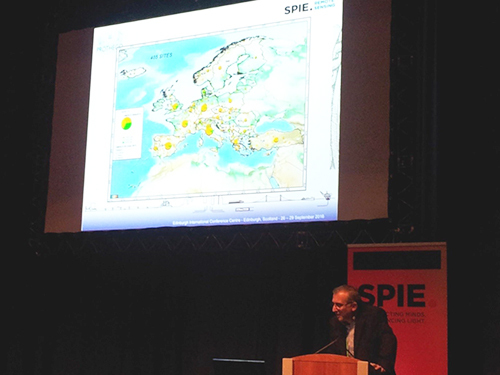 Kyriacos Themistocleous (CUT) and Francesca Cigna (NERC/BGS) presented PROTHEGO and its local scale approach for the demonstration site of Choirokoitia during the Remote Sensing conference of SPIE 2016 on 26–29 September 2016 in Edinburgh, UK – sessions: Active and Passive Microwave Remote Sensing for Environmental Monitoring, and Earth Resources and Environmental Remote Sensing/GIS Applications. A short paper on Choirokoitia will also be published in the SPIE conference proceedings. 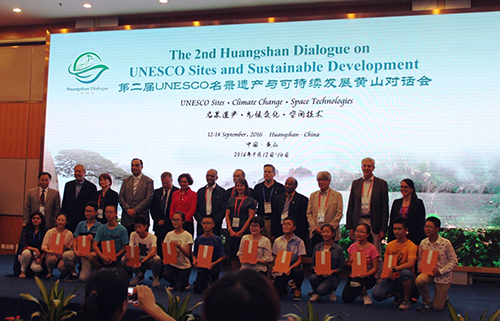 Award ceremony at the 2nd Huangshan Dialogue on UNESCO sites and sustainable development. Francesca Cigna (NERC/BGS) was invited to deliver a keynote on PROTHEGO during the 2nd Huangshan Dialogue on UNESCO sites and sustainable development, 11-15 September 2016, Huangshan, China, and during the closing ceremony was awarded as distinguished international speaker together with representatives and experts from UNESCO, ICOMOS and the Global Geopark Network. DVMWHS Research Framework 2016: front cover and extract. 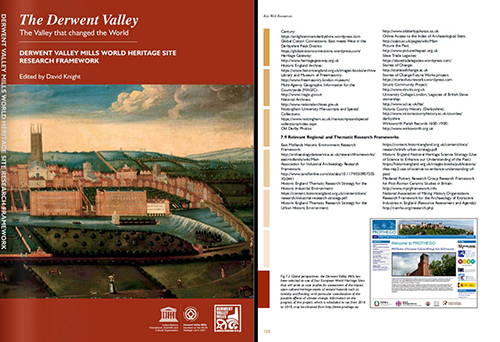 PROTHEGO was mentioned in the Derwent Valley Mills World Heritage Site (DVMWHS) – Research Framework 2016 as one of the initiatives providing a global perspective on assessment of the impact of natural hazards upon UNESCO WHL cultural heritage assets. The Research Framework is edited by PROTHEGO’s Associate Partner, Dr David Knight, Trent & Peak Archaeology, York Archaeological Trust. 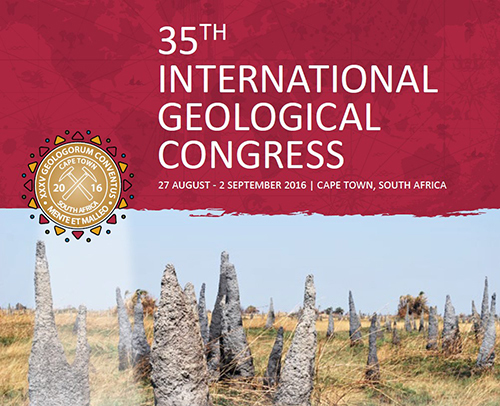 35th IGC, 27 August – 4 September 2016, Cape Town, South Africa. PROTHEGO's objectives, WP1 methodology and initial geohazard assessment results for the European UNESCO WHL sites were presented by Daniele Spizzichino (ISPRA) during IGC "35th International Geological Congress" on 27 August – 4 September 2016 in Cape Town, South Africa, during sessions T8.2a: Geohazards and T1.P1: Geoheritage and Conservation. PROTHEGO's BBC News Twitter report on 4 June 2016. 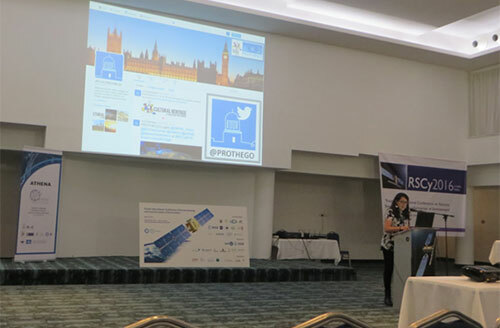 Francesca Cigna (NERC/BGS) presented PROTHEGO at the "Eight Annual Conference of the Italian Remote Sensing Association (AIT)" on 22–24 June 2016 in Palermo, Italy, during the Plenary Session on new remote sensing technologies and applications. 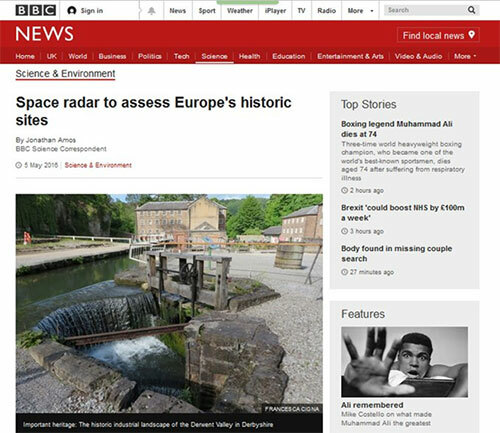 Over 500 tweets & re–tweets were published in the first month after the publication of PROTHEGO's article on BBC News: "Space radar to assess Europe's historic sites". 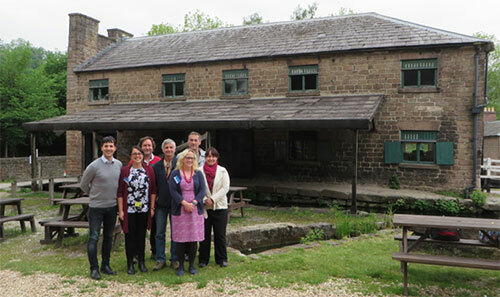 Participants in the DVMWHS demonstration site stakeholder meeting at Cromford Mill, UK. On 26 May 2016, Francesca Cigna, Anna Harrison, Deodato Tapete and Kathryn Lee (NERC/BGS) met the Derwent Valley Mills World Heritage Site (DVMWHS) Stakeholders: Mr Mark Suggitt, Director of DVMWHS, Dr Andy J. Howard, Landscape Research & Management (LRM), and Dr David Knight, Trent & Peak Archaeology (TPA). The goal of the meeting was to appraise PROTHEGO's methodology for the DVMWHS and to identify how PROTHEGO's outcomes can feed into the DVMWHS management process. PROTHEGO's article in the Derwent Valley Mills World Heritage Site website, 6 May 2016. BBC News published an article on PROTHEGO: "Space radar to assess Europe's historic sites" based on Francesca Cigna (NERC/BGS)'s interview with Jonathan Amos, BBC Science Correspondent. Live radio interviews were also given by Francesca on BBC Radio Berkshire during Chris Hollins' show on 6 May 2016, and BBC Radio Derby during Aleena Naylor's breakfast show on 7 May 2016. The latter was jointly with Mark Suggitt, Director of the Derwent Valley Mills World Heritage Site (DVMWHS) and Demonstration Site Stakeholder of PROTHEGO. PROTHEGO's BBC News, 5 May 2016. 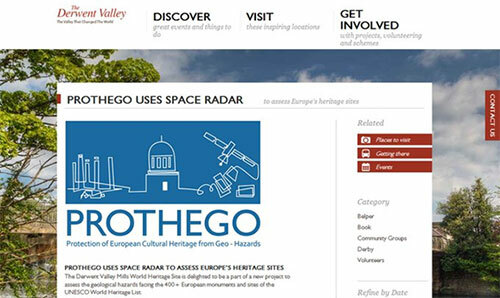 Following the BBC News, the DVMWHS published another article on PROTHEGO in their website: "PROTHEGO uses Space Radar to assess Europe's heritage sites". In.Cyprus: "Choirokoitia site tracked from space"
PROTHEGO's PICO presentation at EGU 2016. 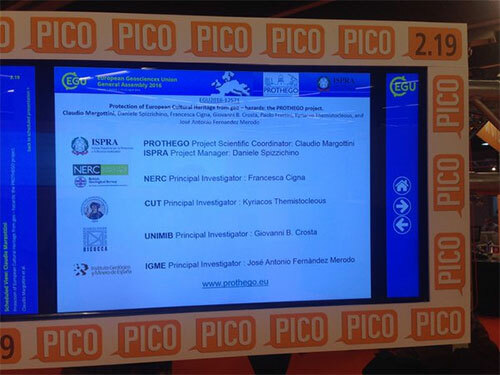 Daniele Spizzichino (ISPRA) gave an interactive PICO presentation "Protection of European Cultural Heritage from geo–hazards: the PROTHEGO project", during session NH6.2 "Multi–Hazard and Multi–Risk studies supported by EO Data" at EGU General Assembly on 17–22 Apr. 2016 in Vienna, Austria. A poster on "The Protection of Cultural Heritage Sites from Geo–Hazards" with a focus on heritage sites in Cyprus was also presented by Kyriacos Themistocleous (CUT). 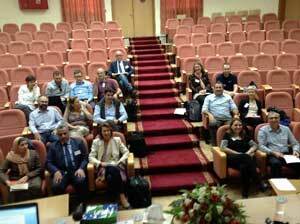 PROTHEGO's second project meeting took place on 4–8 April 2016 in Paphos, Cyprus, during the RSCy "Fourth International Conference on Remote Sensing and Geoinformation of Environment" conference, organised by Cyprus Remote Sensing Society (one of PROTHEGO's associate partners). 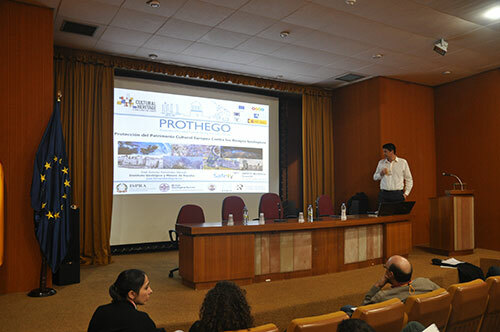 The project methodology and achievements were presented by PROTHEGO's consortium on 6 April 2016 during the special session "Sensing the past: remote monitoring for archaeology and cultural heritage" chaired by Cyprus University of Technology, and during the session on EU projects on 8 April 2016. Claudio Margottini (ISPRA) presents PROTHEGO at the RSCY2016 session on EU projects. Daniele Spizzichino (ISPRA) presents PROTHEGO's WP1 during the Special Session 'Sensing the past'. Francesca Cigna (NERC/BGS) presents PROTHEGO's geohazards in the UK WHL sites during the Special Session 'Sensing the past'. Francesca Cigna (NERC/BGS) delivered an invited keynote lecture at Leiden University during the conference "From Stone Age to Space Age" on 24–26 February 2016, and showcased radar remote sensing applications in archaeological and cultural heritage sites affected by geohazards. 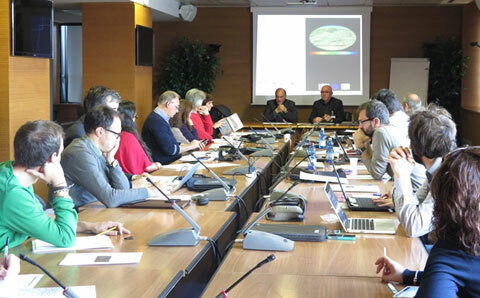 Claudio Campobasso (Director, Geological Survey of Italy, ISPRA) and Claudio Margottini (ISPRA) welcome PROTHEGO's project partners, steering committee and stakeholders. 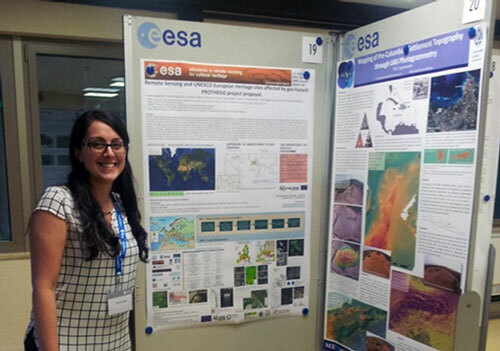 Francesca Cigna (NERC/BGS) presents PROTHEGO's poster at ESA. 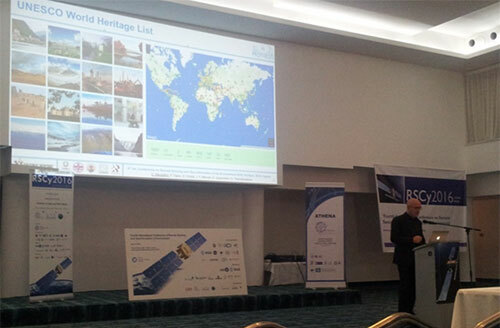 PROTHEGO was presented during the European Space Agency (ESA)'s workshop "Advances in remote sensing for cultural heritage: from site detection, to documentation and risk monitoring" that took place on 12–13 November 2015 in Frascati, Italy. Claudio Margottini (ISPRA) led a poster presentation on "Remote sensing and UNESCO European heritage sites affected by geohazard: PROTHEGO project" illustrating the project objectives and methodology that Francesca Cigna (NERC/BGS) presented during the poster session. 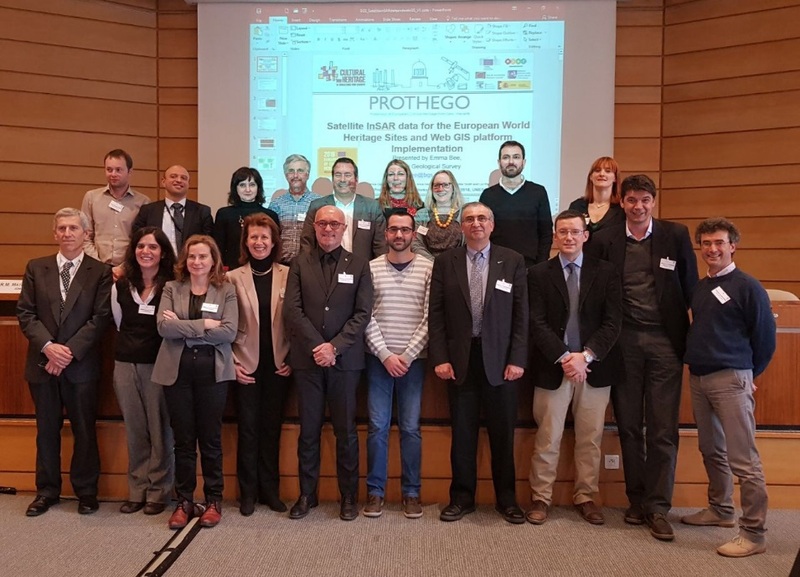 Daniele Spizzichino (ISPRA) presented PROTHEGO during the Earth Observation Expert Group (EOEG) Annual Meeting and landslide/subsidence EuroGeoSurveys (EGS) working group on 28–30 October 2015 in Granada, Spain, and with José Fernández (IGME) visited the UNESCO WHL site of Alhambra and met stakeholders from the Patronage of the Alhambra and Generalife. Claudio Margottini (ISPRA) presented "The protection of European cultural heritages from geohazards and the EU project PROTHEGO" during FLOODIS Int. workshop "Increasing resilience to emergencies through earth observation, crowdsourcing, and satellite navigation systems", that took place at UNESCO Headquarters in Paris, France on 2 October 2015. Daniele Spizzichino and Carla Iadanza (ISPRA) presented PROTHEGO during the workshop "Beni culturali e spazio: tecnologie applicative e servizi aerospaziali a supporto del patrimonio culturale" organised by the Ministry of Cultural Heritage and Activities and Tourism (MIBACT), the Italian Space Agency (ASI), the Institute for Conservation and Restoration (ISCR) and the Association for Space-based Applications and Services (ASAS) on 15 September 2015 in Rome, Italy. Cyprus University of Technology advertised the successful funding of the project in a number of national and local newspapers in Cyprus, including Alithia newspaper, ETEk, SigmaLive Beta, onlycy, Cyprus University of Technology Portal, Paidea News and FG news.